Ht / Wt: 6'3" / 180 lb. 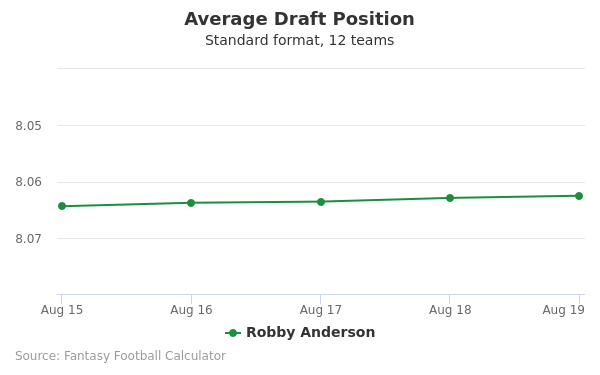 Robby Anderson's fantasy value is measured by his average draft position (ADP) in fantasy football mock drafts. 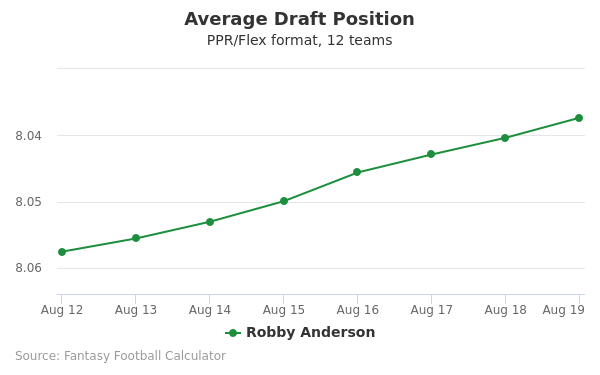 In recent drafts, Anderson's current ADP is 7.07, which indicates that his fantasy outlook is to be the 7th pick of the 7th round, and 79th selection overall. 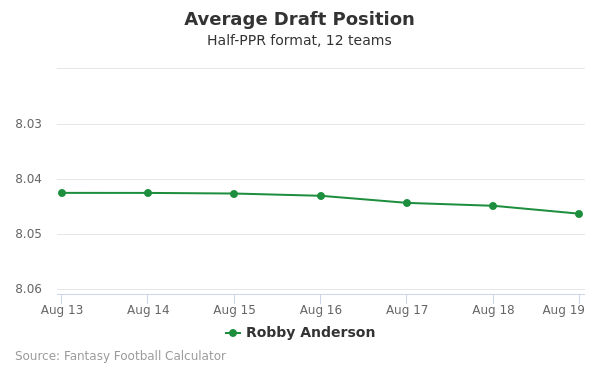 The code below will display a graph that updates every day to show the ADP data for Robby Anderson for the past 30 days in 12-team PPR leagues. Draft Matt Ryan or Robby Anderson? Draft Robby Anderson or Vance McDonald? Draft Corey Davis or Robby Anderson? Draft Philip Rivers or Robby Anderson? Draft Jerick McKinnon or Robby Anderson? Draft Carson Wentz or Robby Anderson? Draft Allen Robinson or Robby Anderson? Draft Peyton Barber or Robby Anderson? Draft Chicago Defense or Robby Anderson? Draft Latavius Murray or Robby Anderson? Draft Jared Cook or Robby Anderson? Draft Josh Jacobs or Robby Anderson? Draft Christian Kirk or Robby Anderson? Draft Jared Goff or Robby Anderson? Draft Emmanuel Sanders or Robby Anderson? Draft Robby Anderson or Royce Freeman? Draft Carlos Hyde or Robby Anderson? Draft Marvin Jones or Robby Anderson? Draft Dante Pettis or Robby Anderson? Draft Cam Newton or Robby Anderson? Draft Courtland Sutton or Robby Anderson? Draft DK Metcalf or Robby Anderson? Draft Austin Ekeler or Robby Anderson? Draft LA Rams Defense or Robby Anderson? Draft DeSean Jackson or Robby Anderson? Start Matt Ryan or Robby Anderson? Start Robby Anderson or Vance McDonald? Start Corey Davis or Robby Anderson? Start Philip Rivers or Robby Anderson? Start Jerick McKinnon or Robby Anderson? Start Carson Wentz or Robby Anderson? Start Allen Robinson or Robby Anderson? Start Peyton Barber or Robby Anderson? Start Chicago Defense or Robby Anderson? Start Latavius Murray or Robby Anderson? Start Jared Cook or Robby Anderson? Start Josh Jacobs or Robby Anderson? Start Christian Kirk or Robby Anderson? Start Jared Goff or Robby Anderson? Start Emmanuel Sanders or Robby Anderson? Start Robby Anderson or Royce Freeman? Start Carlos Hyde or Robby Anderson? Start Marvin Jones or Robby Anderson? Start Dante Pettis or Robby Anderson? Start Cam Newton or Robby Anderson? Start Courtland Sutton or Robby Anderson? 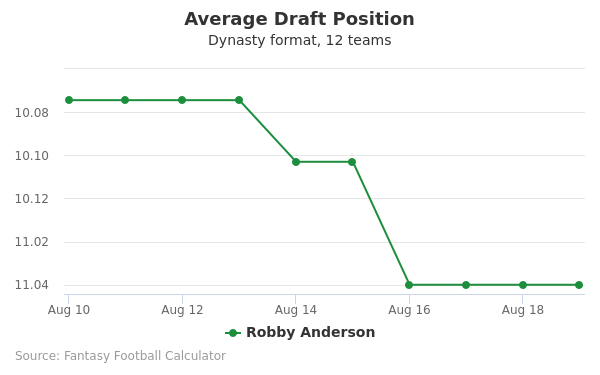 Start DK Metcalf or Robby Anderson? Start Austin Ekeler or Robby Anderson? Start LA Rams Defense or Robby Anderson? Start DeSean Jackson or Robby Anderson?